Real world cycling is affected by changes in wind speed and direction. 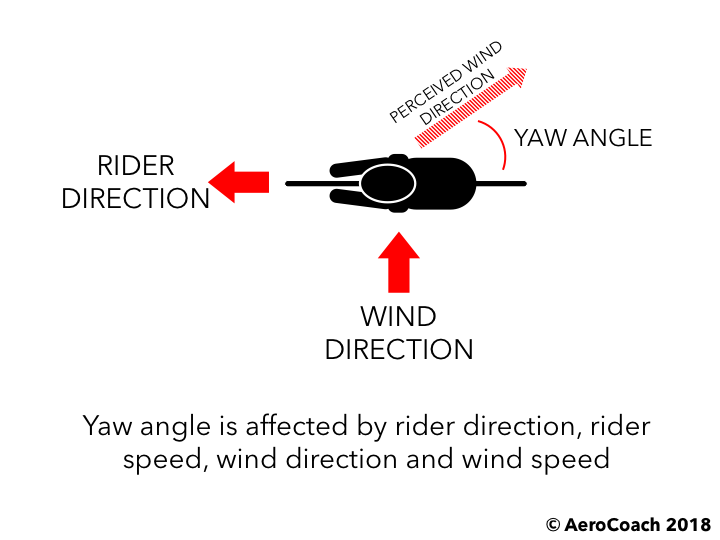 The angle of attack of the wind on the cyclist is referred to as “yaw angle”, and this is affected by four components - rider speed/direction as well as the wind speed/direction. 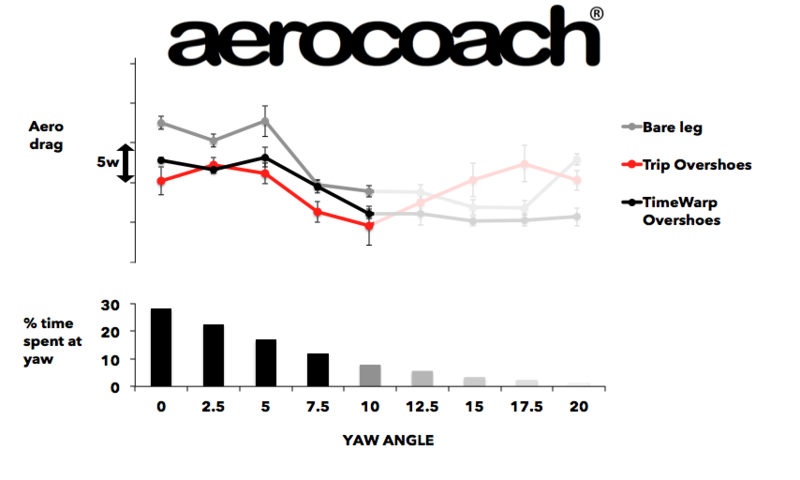 While cycling during a time trial and triathlon, you will experience a range of yaw angles. Very high yaw angles are much less common than lower yaw angles, and this can be expressed as a weighting function - for example at 45kph you spend ~80% of your time at 7.5deg yaw or less. At <40kph this extends out to 10deg, and at >50kph you will see 5deg or less. 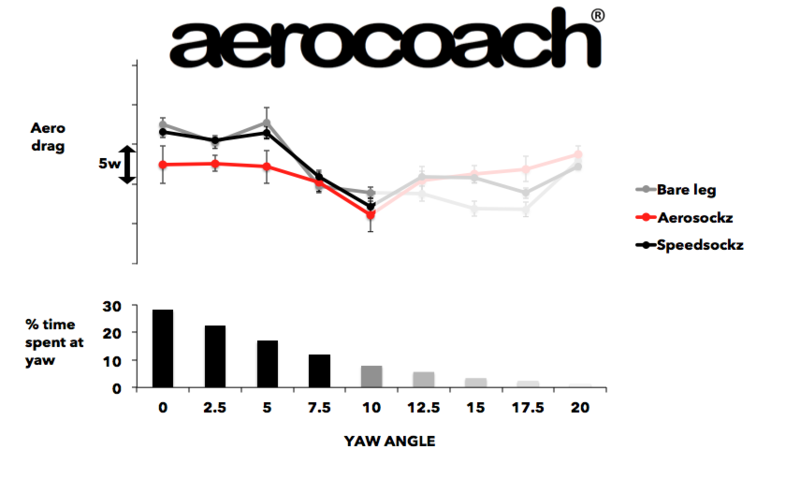 For this reason the AeroCoach ATS® range is designed to work at <10deg yaw, to make use of the real world yaw angles that you will experience at a range of speeds. Below is a series of graphs from wind tunnel tests: our test rider was 72kg, 182cm tall and was riding at 90rpm. Test speed was 45kph. Using Tripsockz2 on your lower leg is dramatically faster at lower yaw angles (5-7w faster at 45kph). This wind tunnel data at 45kph compares a bare lower leg with no shoe cover to wearing Tripsockz on your lower leg, again with no shoe cover. 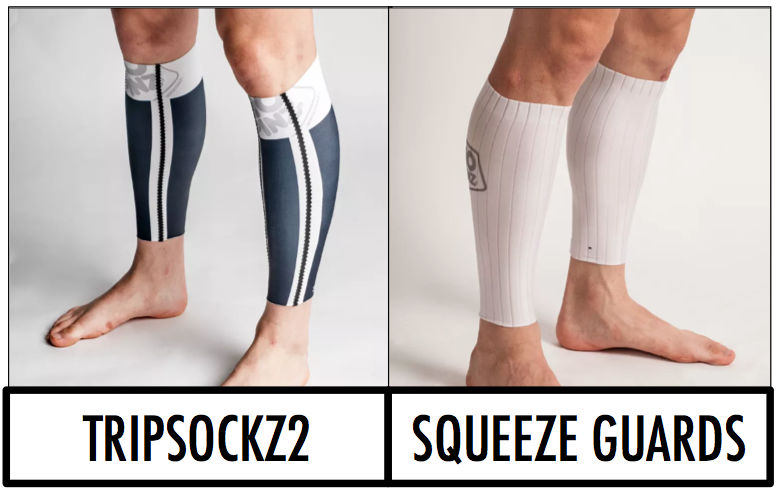 The trips on the front of the leg allow Tripsockz2 perform best at the yaw angles you will experience more, and become slower at much higher yaws that you won’t see whilst racing. 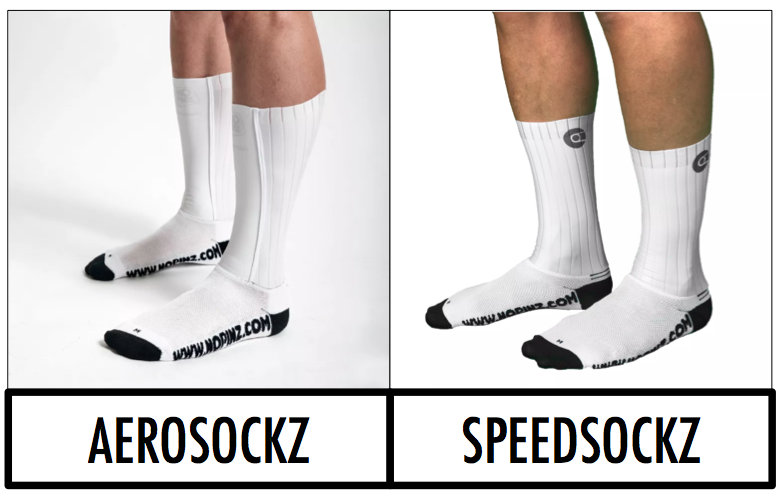 Aerosockz are a good option for UCI legal competition such as road racing or track racing. Similarly to Tripsockz, the seams on the front of the Aerosockz trip the airflow at racing yaw angles, but there is less of an advantage over bare leg compared with Tripsockz. 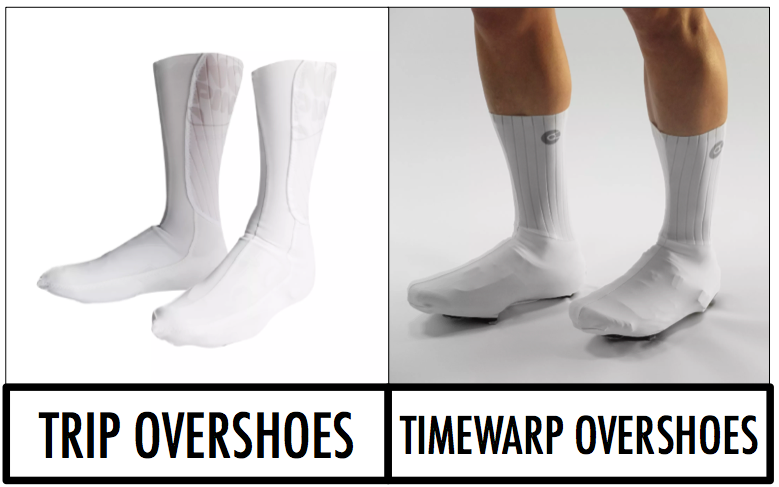 Trip Overshoes are another UCI legal option and also cover the shoe. 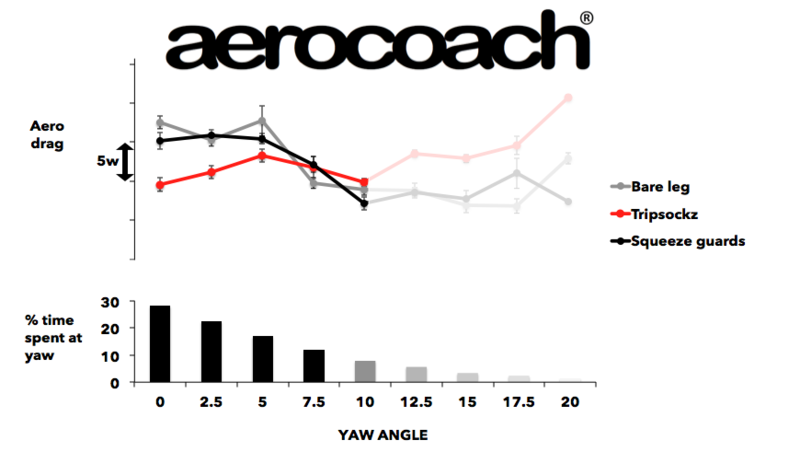 This graph compares an uncovered shoe to Trip Overshoes, and again we can see that the seam placement on Trip Overshoes down the front of the shoe and up each side of the leg results in lower aerodynamic drag at the lower yaw angles when it matters.